If you will set aside his formal demeanor, Stephen Tan would easily pass up as an ordinary teenager. With his hands always glued on his cell phone, it would be easy to brand him as one of the young people who send a million text messages a day. Stephen rarely sends text messages though. If he would, it would be just a few short messages to his Mom, Dad or church mates. He mostly uses his cell phone to record the lyrics of his songs. He is a young songwriter with a big life purpose: “I want to serve as an inspiration to the youth”. Stephen started singing in their church when he was six. His mom, who also has the talent in music, serves as his mentor and inspiration. Mrs. Elsa Tan who also joined amateur singing contests during her youth has passed on the interest in singing to her first born. Stephen fondly shares, “My mom is my coach. Everything I do on stage, I learned from her”. Stephen is not one to disappoint his family, especially his mother. He won several amateur competitions and through the perseverance of his mom, was able to get a nine-month scholarship in the Music School of Maestro Ryan Cayabyab in 2009. Out of 200 children who joined the audition, Stephen was among the eleven scholars who passed the various phases of musical training at the Maestro’s famed music school. The music program not only honed Stephen’s musical abilities but also his confidence on stage and the desire to achieve more. When Stephen learned about Project ArAw (stands for Aral-Awit) Songwriting Competition through his teachers in Lagro High School, he knew that it was important for him to join. Project Araw is a music-driven values education program spearheaded by Nokia and ABS-CBN Foundation aimed at inspiring the youth to express their values through songs. It espouses the values of honesty, self-sufficiency and social responsibility. Stephen was riding the jeepney on the way home from school when an inspiration for a song struck him. As he normally does, Stephen entered his composition on his treasured cell phone. “I would rather lose my wallet, than my cell phone”, he jokes. He finished the lyrics and melody of his song on the last day of submission of entries. One of his teachers kindly agreed to personally bring his entry to the ABS-CBN Foundation office. The teacher made it just in the nick of time. The rest is history so to say. 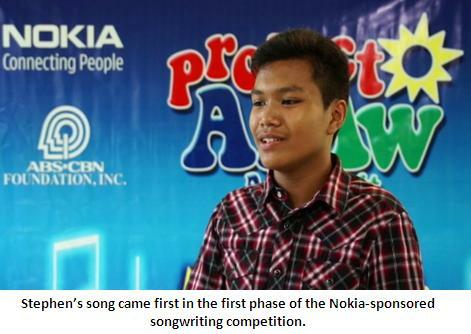 Stephen’s song came first in the first phase of the Nokia-sponsored songwriting competition. His composition entitled “Tara Na” encourages the youth to be proactive and make a meaningful change in society. The message of the song, as well as the melody captured the heart of the judges. The message of his song is deep. Stephen is too old to be just fourteen. Even his mom agrees, “maybe because as the eldest, he sees the hardship me and his father go through to bring the family up”. He is thankful for Nokia and ABS-CBN Foundation for conceptualizing Project ArAw as it inspired him to compose more and achieve more. His message to the youth: “we only have a few years to be fully active. Let us strive to spend our life doing good things. Do not waste time on things that are not beneficial and of course we have to serve God and be responsible citizen of our country”. Even the older generation can learn so much from Stephen. Indeed, he is not an ordinary teenager.